Amanda started her professional life with a brick and mortar business. When things didn’t work out, she went on to found a subscription box business. Amanda made the decision to do subscriptions because she didn’t want all the overhead associated with a brick and mortar and she wanted to be able to grow her business almost entirely with Facebook ads. She succeeded on all fronts, but realised during the process that what she enjoyed most about her business was the marketing aspect. She was able to sell her subscription business and began focusing solely on helping other businesses optimize their Facebook ad marketing. Amanda wants the world to know –Facebook Ads DO work. Even if you’ve tried Facebook ads in the past without success, it’s important to recognize that they do work with the right strategies. Too many people give up too soon, don’t allocate appropriate resources or simply don’t have a good strategy and end up with failing Facebook ads. Listen to learn which type of Facebook ads will be most successful for your business. For businesses who have a healthy budget, Facebook ads can be a great driver of sales. Users should first understand that Facebook ads are a long game. The first weeks are very unlikely to result in sales. Businesses need to consider the first few weeks of running an Facebook ad campaign a testing period that will only result in sales over the long term. For those people who don’t have a large budget or are selling a product with a retail value of $20 or less, it’s important to think about other ways Facebook ads can be useful. Instead of launching an ad campaign to drive sales, use ads to build your mailing list where you can nurture and convert to sales. By nurturing clients through email marketing, businesses not only convert, they also build loyalty, which produces greater results over the long term. If you don’t have the money to invest, Perry says that’s ok, but you’ll need to invest time. Either way, Facebook ads can be an important marketing tool in your overall kit. She says that if you can crack the code to FB ads, you can essentially turn your sales on and off down the road. Reach ads will blast a bigger group while traffic ads target people most likely to click through to your website. Both of these options are great for smaller budgets and feeding the Facebook algorithm. 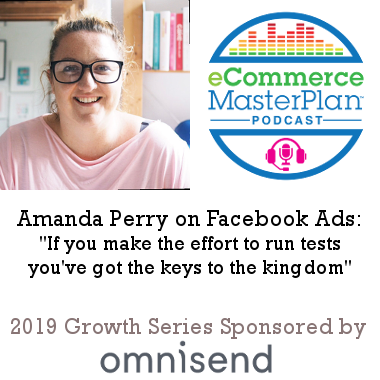 Above all, Perry says that testing is the most crucial component for success when it comes to Facebook ads. Whatever the scenario, testing is a must and every audience is different. Taking the time to test before pouring money or resources into anything FB related will save heartache down the road. Straight to your website where there is some CTA like a pop up with a sign up option. Straight to a Blog post with your email newsletter and a sign up option. Competitions, which do really well because of the increased engagement. Contrary to popular sentiment, the Facebook algorithm is your friend, but you need to feed it with the correct information. Amanda says that Facebook industry leaders agree that Facebook ads are 30% knowledge and 70% letting Facebook do it’s thing. If you have an established brand and have been using the Facebook, the algorithm needs at least 500 impressions just to understand what’s going on. If it’s starting fresh, Facebook needs at least 8,000 impressions at the ad set level and 50 conversion events in order to optimize. Most people don’t get to that point because they tinker with or turn off their ads altogether. Listen to learn how to deal with the Facebook Algorithm. There is a way around the considerable time and resources necessary to convert for sale. Instead of optimizing for purchase, consider optimizing for add to cart or for view content. If you can get 50 content views, Facebook will begin to understand who it needs to be showing your content to. The essential tool for using Facebook ads is Facebook Pixel. Every business who is using Facebook ads needs to install facebook pixel to track and understand their customer, no question. If you’re unsure where to start, simply putting 5 pounds a day on a traffic campaign is a great first step. By feeding Facebook daily, it begins to build a groundwork to understand your product and successfully share with the right people. What kind of posts should businesses be doing? The question on everyone’s mind is no doubt what kind of posts work the best? Perry says that there is no magic bullet but there are some patterns. For eCommerce, video campaigns do very well. Not only are you getting your message out, but you’re building up a video audience. You can then use that information to send retargeting ads. For coaching and to some extent, eCommerce, single image ads are very successful. Single image ads are also great for testing because you can run the same ad with several images and see which performs the best. In general, short copy for eCommerce and mid to longer copy for coaches works best. By making slightly longer copy, coaches especially are able to weed out the tire kickers in favor of click through. No matter your business, it’s a good idea to create a bit of intrigue in the ad to entice potential customers to click through to your website. Perry is predicting that Facebook ads are going to explode in 2019. If you’re not in the game, you need to get involved. More and more companies are building their business around facebook niches. There are a lot of businesses out there now who are completely reliant on Facebook and Instagram ads and are becoming highly proficient. Facebook is starting to create more real estate for advertisers. Facebook stories, groups and an up and coming dating segment of the site are all potential new spaces for advertisement. These new spaces may up the competition, but they will also keep the prices low. In general, Perry says there will be a lot of opportunities in 2019. Understand Ads — understand how to drive traffic to your website.